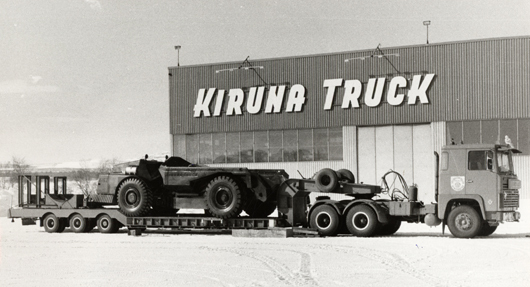 Kiruna Utility Vehicles would not exist if it weren’t for the ingenuity and entrepreneurialism of the product development company Kiruna Truck, which was founded in Kiruna in 1959. Located in the same town in the north of Sweden as the Kiirunavaara mine, the product development company Kiruna Truck based its business on genuine knowledge of the growing mining industry’s needs and requirements. Through advanced design skills and major investments in an effective marketing and sales organization, the small-town company Kiruna Truck gained success on the international market, exporting its products to major mining nations around the world, such as Canada, Chile, Russia and South Africa. 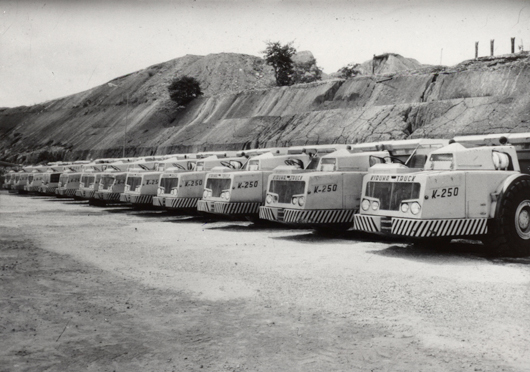 Over the 40 years that Kiruna Truck operated in Kiruna, the company employed 40-50 people and successfully specialized in 3 product categories: trucks for mines, trucks for steelworks and trucks for tunneling work. When Kiruna Truck was acquired by GIA Industri in 1998, and the production was moved to a different part of Sweden, it looked like Kiruna’s long history of truck manufacturing had come to an end. However, nearly fifteen years later, when GIA was bought by Atlas Copco, another Kiruna company seized the chance of bringing truck manufacturing back to its home town and closing the circle; Nybergs Mekaniska Verkstad acquired Kiruna Truck’s product range for steelworks and smelters from Atlas Copco, and in 2012 Kiruna Utility Vehicles was established, as part of the NMV Group.